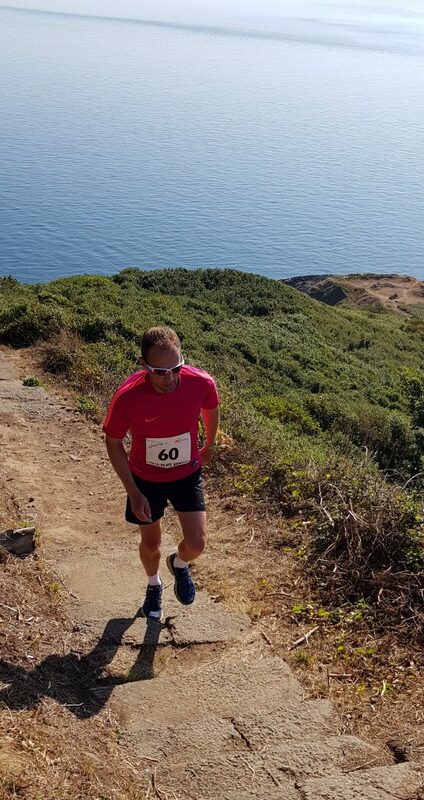 In-form James De Garis comfortably strung out the field in today’s Cliff Series opener, contested over the Havelet-Petit Port-Havelet loop (6 miles) on a sweltering morning. De Garis was already out of sight of his nearest contenders Ben Langlois and Jamie Ingrouille by the steep descents near Marble Bay and went on to win in 52:16. The next two men jostled for positions throughout but Ingrouille pulled away on the Fermain climb to take second in 54:22 to Langlois’ 54:35. Supervet Chris Travers won the battle for the first veteran across the line with a strong run of 58:45. Sister Caroline Creed, also a V50, ran well to take the women’s honours in 61:45, six minutes clear of nearest rivals Nikki Neal and Elyse Dandeker. A big “thank you” to all the helpers. Particularly those from JP’s Running Group.